Click here for. . .
insert you want to use. Install with a hex key. #8-32 screw size - 10 mm (3/8") long. install with 4 mm hex key. #10-24 screw size - 13 mm (½") long. 1/4-20 screw size - 13 mm (½") long. 1/4-20 screw size - 20 mm (¾+) long. 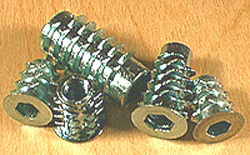 5/16-18 screw size -  13 mm (½") long. 5/16-18 screw size -  25 mm (1") long. 3/8-16 screw size -  13 mm (1/2") long.